I’ve decided to wear more color from now of on! I think I’m also looking for a ”valid” reason to go shopping again haha. 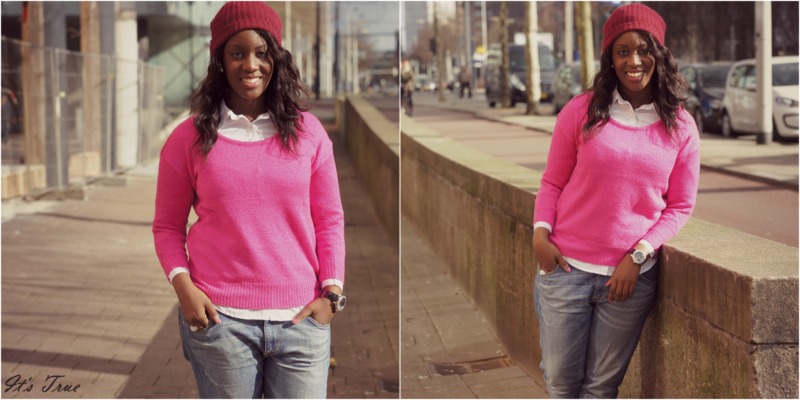 In this post I decided to go for a popping pink sweater, burgundy beanie and some baggy jeans. It was an easy going day. Me and my friend decided to hit the streets and do some streetstyle of others. This was my first time randomly doing streetstyle. I was so shy hahaha but it’s so fun to do! I might do it more often. So after that, we went to one of the best cake shops in my opinion to eat DELICIOUS (yes in capitals) desserts. Just another great day. Love this look! So cute! I adore that color pink! neon pink looks so good on you! cute look! Love your sweater!! It's perfect! Prachtig die trui! Kleur staat je heel mooi!! Mjao ! You look beautiful in trhis hot pink, I should follow your example and start to dress more colorful aswell ! wat leuk die knal roze trui, staat je echt goed!